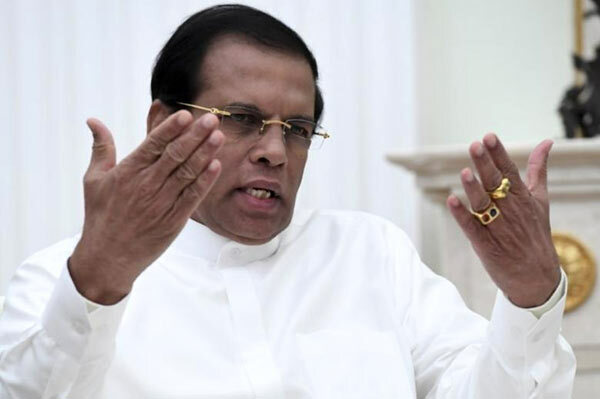 Sri Lankan President Maithripala Sirisena on Thursday pledged to consult the country’s Buddhist leaders over his plans for constitutional reform, which he promised in his 2015 election campaign to bring about reconciliation among all ethnic groups. Sri Lanka in January last year proposed plans for a new constitution aimed at devolving power and preventing the kind of ethnic tensions that led to the long civil war that ended in 2009 and to strengthen democracy, promote reconciliation and establish a political culture that respects the rule of law. The 1977 constitution, which experts say has given more power to the federal government, is blamed for the civil war which killed more than 100,000 people. The Sirisena administration’s move has been welcomed by the international community, who have softened their demands for a tough United Nations-led war crime probe over alleged abuses during the civil war. But the island nation’s Buddhist leaders are opposed to introducing a new constitution, for fear it may reduce their influence among the population of 21 million, about 70 percent of whom are Buddhist. “The president said respected (Buddhist) clergies will be educated, and their opinions and suggestions also will be considered in the event of drafting a new constitution,” President’s media office said in a statement after a meeting with the highest Buddhist officials. More than 75 leading monks on Tuesday unanimously declared that there was no need for a new constitution or for any constitutional amendments now, local media reported. Some opposition members have alleged that the new constitution has been drafted to please some Western nations and to dilute the influence of Buddhism in Sri Lanka. The government has rejected such accusations. Rajitha Senaratne, the government spokesman, on Wednesday said President Sirisena was given a mandate for a new constitution at the January 2015 presidential poll. “The monks are totally misinformed,” he told a weekly cabinet press conference. Mahinda is a crook. This man is worst. He is selling the rights of majority Sinhalese to other ethnic minorities to just to get reelected. This man is frighten that Mahinda will come to power and destroy him. So only way that mess created by him and his prime minister is to be in power, what ever the cost might be. When he came to power he said he is only be the president for one term, That is out of the widow now and blaming every body other than them self. Another Window dressing. Another meeting with Maha Sangha is just symbolic. Buddhism…Buddhism is a Mantra to keep the Buddhist majority happy and get their votes. All this rubbish is leading to Yahapalana Version 2 which will come up after the next General Elections. The Deputy Yahapalana Boss will be the President and NR will be the PM. the Boss is wearing double stone studded rings on his fingers strongly following the the footsteps of his predecessors. God bless Yahapalana on their path to doomsday ! !